Occult | Halloween: What's a Christian to Do? 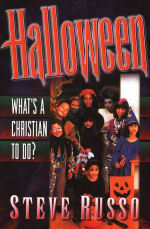 | Watchman Fellowship, Inc.
Halloween: What's a Christian to Do? Trick-or-treaters parading from house to house, lawns decorated with witches and hobgoblins---what's a Christian to do? Russo, a father and youth evangelist, offers practical tips for raising kids in today's secular culture; informative facts about occult and pagan festivals; and sound biblical guidelines for creating alternative activities that celebrate God's victory over evil.